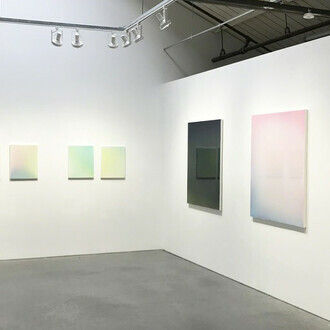 Nancy Toomey Fine Art is pleased to announce an exhibition of works by Casper Brindle entitled "Chromatic Flux" on view from February 20 to March 30, 2019. 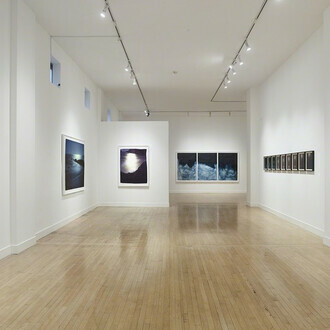 The gallery is located inside San Francisco’s Minnesota Street Project, 1275 Minnesota Street. The public is invited to the artist reception on Saturday, March 2, from 5pm to 7pm. The artist will be present. Casper Brindle’s sumptuous paintings are more than a feast for the eyes. 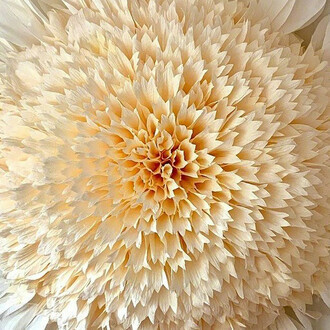 They are an entrance into the mystic realm of color, an invitation into a meditative space where change and impermanence may be experienced viscerally. 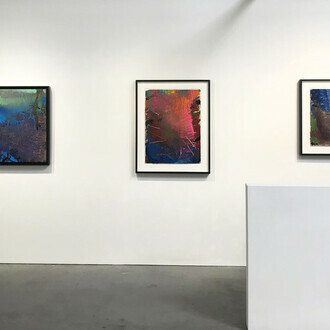 Brindle is a master colorist, interested in the emotive power of his medium, which he explores simultaneously with the two bodies of work presented in this exhibition: "Strata" and "Portals." The "Strata" series finds Brindle pushing the expressive possibilities of color while working within his boldly established pictorial structures. Repetition of form is intrinsic to his exploration of color. This precise dividing of the picture plane in half gives Brindle an architecture in which to experiment wildly with color. Though the materials he utilizes are industrial in nature (automotive paint and resin), the way in which he applies pigment in delicate sprays allows for subtle chromatic gradations. Pairing together unusual colors results in unexpected harmonies that vibrate with radiant energy. The inherent properties of the materials Brindle uses enhance the interactive experience of viewing his work–the iridescent pigments shift and scatter light in myriad ways. 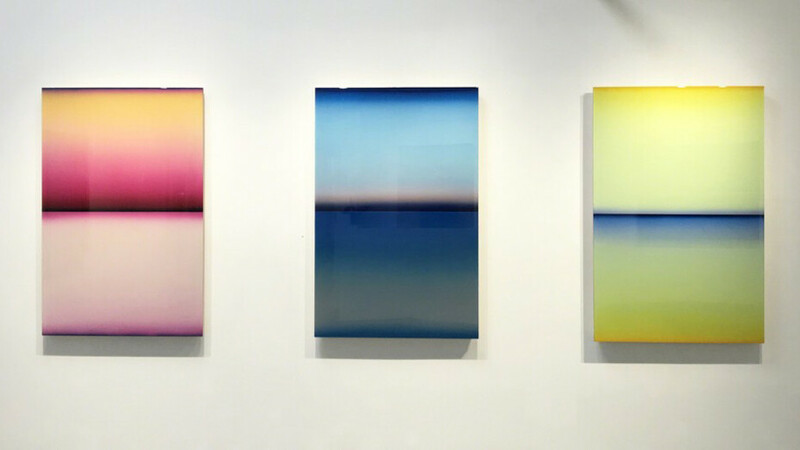 What is most profound about the "Strata" paintings is Brindle’s ability to capture with pigment and resin fleeting moments in time, reflecting those instances when the sun dips below the horizon and the colors in the sky shift most spectacularly. Each painting changes depending on the environment it is situated in and the position of the viewer. 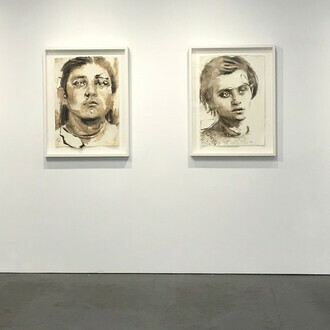 These works have an ephemeral quality–the viewer can experience them in infinite ways and perhaps never exactly see them the same way twice. His work explores the incomprehensible majesty of the natural world, and the essential truth that change is ever-present. The "Strata" paintings are typically oriented horizontally, but Brindle presents several new works in vertical format for this exhibition. The horizon line is present and the depth of field is just as impressive as with their horizontal counterparts. 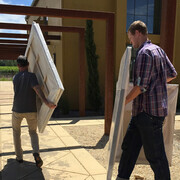 However, this simple gesture changes the paintings dramatically, suddenly giving them the appearance of doorways to places unknown. 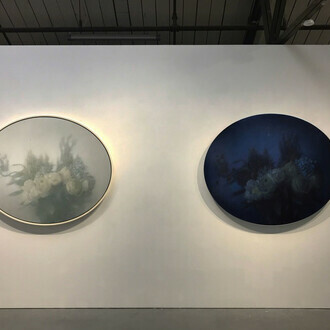 Brindle’s newest body of work–the "Portal" series–evolved from the otherworldly, monochromatic Aura paintings that he debuted in early 2017. Sharing the central form of a luminous bar of metallic leaf, the new works diverge from their pearl-white predecessors with richly saturated colors. 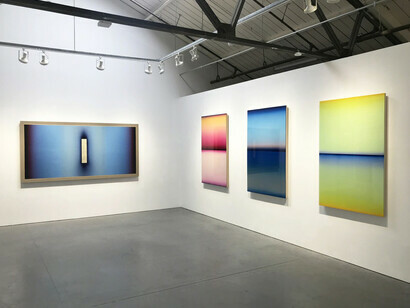 Painted on linen rather than panel, the surfaces are stained with gradients that radiate from light to dark, as if the beacon-like central form is pulsating with light. The nuanced application of paint invokes the meditative and emotional quality of Rothko, while the use of gold and silver leaf recalls Byzantine icon paintings. Enshrouded by brilliant color, the metallic bars become even more pronounced, their monolithic presence stirring an enigmatic response. Color and structure become inseparable as the viewer is drawn deeply into the picture plane, left to ponder the mysterious imagery that the artist has presented. Los Angeles based artist Casper Brindle specializes in mixed media abstraction, Light and Space, and Finish Fetish. Born in Toronto, Canada, shortly after his parents emigrated there from England, the family moved to Los Angeles in 1974. Brindle’s life spent between the beaches and alleys of LA’s Westside during the 1970s and 80s is reflected in his use of color, material choices, and visual vocabulary. 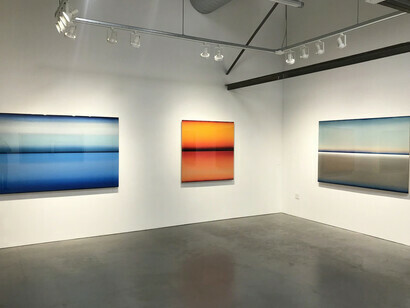 He worked for Light and Space artist Eric Orr in the late 1980s, and the movement, as well as the landscape from which it arose, has effected the artist’s own production. 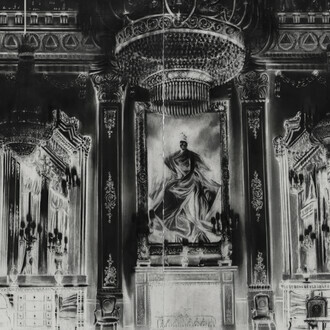 Brindle’s art has been exhibited widely in the United States and Europe, and written about in, among others, The New York Times, Wall Street Journal, and Art in America. 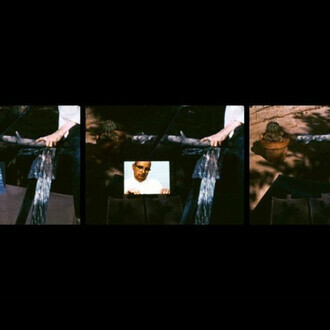 His work has been exhibited at institutions across the US and internationally, and is held in a number of prominent private and museum collections including Morningside College Collection in Sioux City, Iowa, and the Frederick R. Weisman Art Foundation. 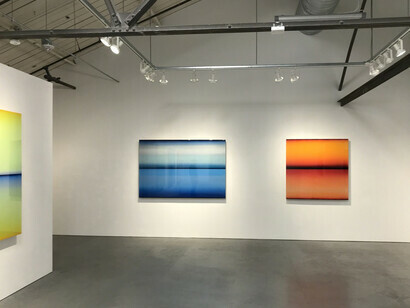 Nancy Toomey Fine Art is a venue in San Francisco for established and emerging artists whose work exemplifies the innovation of contemporary art.